Flowchart diagrams visually illustrate entire processes with all possible outcomes. Flow diagrams are used in many occasions for easily describing each stage of a process while taking into account the possible milestones during the process steps. They help the development and standardization of the ways a process is performed and eliminate any possible mistakes. What do you need to create a flowchart diagram? The beginning of the flowchart could be either the first step of the process or the event/need triggering it. For example, the first step of a flowchart describing the process of installing a computer software might be to Download the software or Insert the software's CD. If an event gives the start of the flowchart, the first step of it could be the event itself – e.g. 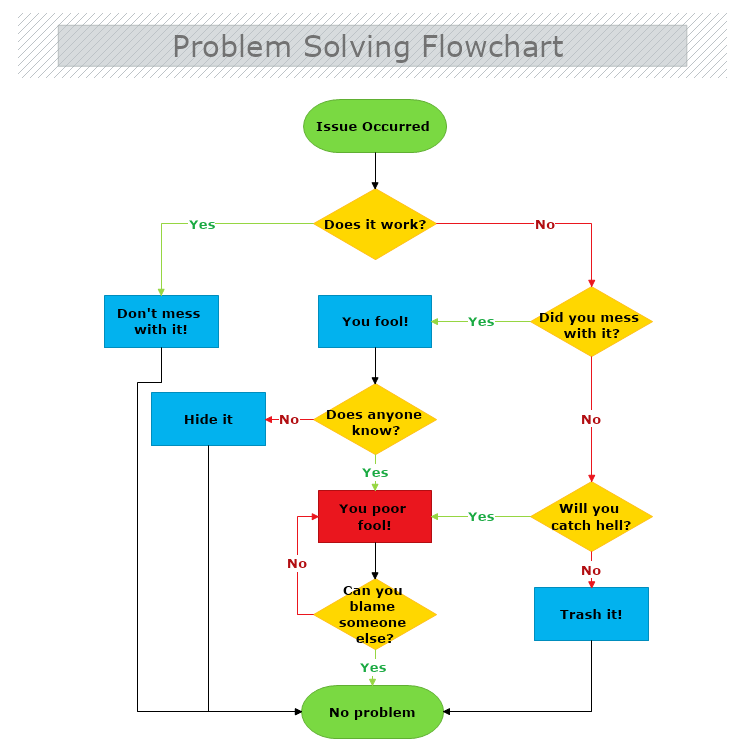 when a problem has arisen and we need to create a flowchart the steps of which will solve it. In this case we can simply place Issue Occurred as the first stage of our diagram. Once we have the beginning of the flowchart, next step would be to specify the process in detail. This is done via decision flow that splits the flowchart into smaller and more manageable sub-processes. In our example the second step is to verify the stage of the problem by answering the question “Does it work?” (assuming that the problem may be a computer which stopped working). From this stage on we should dive in detail and describe each following step with all possible outcome. Flowchart diagrams don’t limit you to only one possible outcome – there can be as many outcomes, as the process requires. In our example there are two possible outcomes: "You poor fool" and "No problem".